Above: Britt Robertson, Scott Eastwood, Oona Chaplin and Jack Huston star as two couples figuring out life in two different time periods in “The Longest Ride.” Stock Photos. * This article was awarded third place for Best Review (High Frequency – Student Division) at the Sunshine State Awards. Nicholas Sparks’ newest book-to-film adaptation brings out what audiences have become accustom to seeing in his work, but manages to rip the hearts out in a new way. 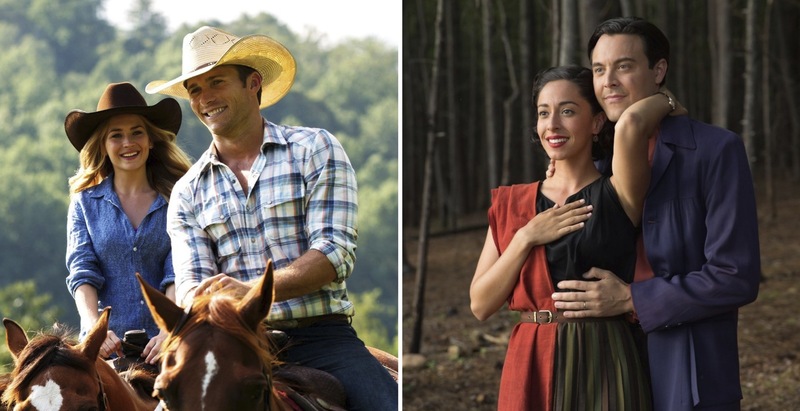 “The Longest Ride” follows two love stories that are from completely different eras. Sophia (Britt Robertson) and Luke (Scott Eastwood) meet Ira (Alan Alda), who is left on the side of the road after a terrible car accident. As Sophia helps Ira recover in the hospital, he takes her on a journey with his younger self (Jack Huston) and the love of his life, Ruth (Oona Chaplin), teaching Sophia the lessons of true sacrifice. Those who have read the novel will be surprised with the many changes in the telling of the story. One of the major changes within the film adaptation is the moment in which Sophia and Luke’s story crosses paths with Ira and Ruth’s. In the novel, the reader is left with suspicion of when the two stories connect until the very end, whereas in the film it establishes the relationship right away. While “The Notebook” is arguably the best of Sparks’ films, “The Longest Ride” comes the closest to topping the 2004 film. In addition to the already established storyline, the actors bring life to the characters in a way that audiences have not seen since Rachel McAdams and Ryan Gosling. The chemistry between Sophia and Luke as well as Ira and Ruth will tug at the heartstrings. While Ira and Ruth’s story is shown in flashbacks, the audience witnesses Sophia and Luke’s story take off in present day. When Sophia’s sorority sister Marcia (Melissa Benoist) takes her unwillingly to a professional bull riding (PBR) competition, fate comes into play when Luke’s cowboy hat lands at Sophia’s feet after a near-miss collision with the bull he was riding. Eastwood had been a huge fan of PBR before taking on the role and was excited to work closely with the professionals. Sophia is a senior about to graduate from college with an internship at an art gallery in New York City already lined up. Though she is a strong and motivated character who is confident about her career path, Ira teachers her how to let love in her life while still achieving personal accomplishments. Throughout filming, Robertson had not fully realized how much she related to Sophia until now. Going back to the 1940s, Ira is a young Jewish man who falls for the new girl in town from Vienna. After being too afraid to talk to her, Ruth finally approaches Ira after temple one day, which is the start of their longest ride together – called life. Throughout their story the audience learns a bruiting lesson on true sacrifice. While many expect to fall solely for Sophia and Luke’s relationship, Ira and Ruth will be the ones that bring out every single emotion from the audience. Sparks’ grandmother, an Irish catholic, developed a relationship with Leo Robin, a man who took the role of Sparks’ pseudo-grandfather while growing up. Sparks spent many years with Robin, who was actually the inspiration behind Ira’s character. Throughout his preparation, Sparks did major studies of the arts and timeline from the 1940s that correlates with Ira and Ruth’s story. Whether the book is familiar or the film experience is new, viewers alike will enjoy the tale of two love stories colliding before their own eyes. “The Longest Ride” is now open in theaters nationwide.